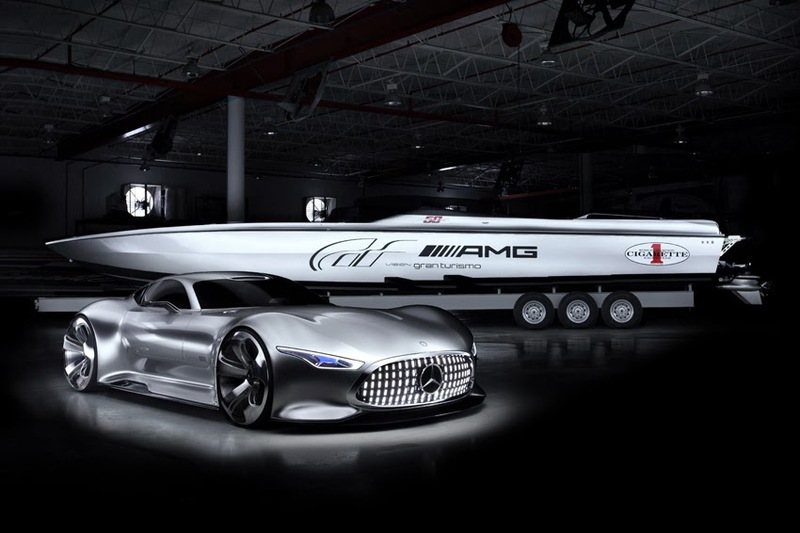 AMG Vision Gran Turismo Concept car and the Cigarette Racing 50' Vision GT Concept. For the new PlayStation3 racing game Gran Turismo 6, Mercedes-Benz designers developed the ultimate concept of a super sports car - the Mercedes-Benz AMG Vision Gran Turismo. Extreme proportions, sensual contours and intelligently implemented high technology blend to form a body that visually brings to life the breathtaking performance of the AMG V8 front-mid engine with 577 hp (430 kW) and 590 lb-ft of torque. Realised as a 1:1-scale model, the Mercedes-Benz AMG Vision Gran Turismo celebrated its world premiere on November 19, 2013 at the opening of the new Mercedes-Benz Research & Development Center in Sunnyvale, California. The super sports car with its hallmark Mercedes gullwing doors made its motor show debut in Los Angeles on November 20, 2013 and then took to the virtual racetrack when the new racing game went on sale in December 2013 - as the first of the 'Vision Gran Turismo' series of vehicles. To mark the 15th anniversary of the popular Gran Turismo series in 2013, Kazunori Yamauchi, Creator of Gran Turismo and President of Polyphony Digital Inc., called upon the world's leading automotive manufacturers and design studios to look forward into the future. Using the theme 'Vision Gran Turismo', these creative teams were to develop concept models which give a unique insight into the further development of the automobile. As virtual vehicles that nonetheless function just like a real car, the visionary concepts will be gradually unveiled in and integrated into the new game Gran Turismo 6 through online updates. The Mercedes-Benz AMG Vision Gran Turismo was the first concept of the 'Vision Gran Turismo' series to be integrated in the game, released in December. The Mercedes-Benz concept car perfectly embodies the design philosophy of sensual purity. The technical details engineered with utmost precision, such as the headlamps, the front grille and even the tailpipe trim, create a deliberate contrast to the sensual design idiom of the vehicle body and bolster its breathtaking appearance on the road. While this concept car is a vision that is not committed to production, it does preview design inspirations for the future of Mercedes-Benz. The sports car proportions that are a typical Mercedes feature are reinterpreted in the Vision Gran Turismo - the long bonnet has a flowing transition into a compact greenhouse offset to the rear, which takes the form of an aerodynamically efficient water drop to descend slightly at the rear, where it rests on the rear end with broad shoulder contours. The dynamic aura is accentuated by an extended, dramatic side contour and a pronounced bulge to the wheel arches, which blend into the low-slung, muscular bodyshell. The extraordinary headlights, with their colour scheme and determined look, convey a sense of sportiness and readiness to leap forward. This impression is reinforced by the hood with its expressive forms and motorsport details, such as the release catches on the bonnet and the fuel cap, for example. The red-glowing contour lines on the lower part of the vehicle create an effect similar to that of exterior ambient lighting and stand out from the silver-painted bodywork. This makes the Mercedes-Benz AMG Vision Gran Turismo look even more expressive. The exterior design of the Vision Gran Turismo, which is systematically and passionately geared to motor racing, is congenially mirrored in the interior of the two-seater. Inspired by the Formula 1 cockpit, the red integral sports seats blend into the black flooring of the footwell to form a protective shell. The form of this flowing, sculptured shell suggests enormous forward thrust. The dashboard also creates an equally dynamic effect. It has been designed in the form of two gullwing doors which are positioned on each side of the steering column. As a result the actual doors themselves appear to be an extension of the instrument panel. Virtually simultaneous to the development of the Vision Gran Turismo was the special development of the Cigarette Racing 50' Vision GT Concept, a one-of-a-kind special model which is the most powerful production twin engine performance boat ever developed and built by Cigarette Racing. The collaboration between Cigarette Racing Team, Mercedes-AMG and Polyphony Digital Inc. created one-of-a-kind elements for the Cigarette Racing 50' Vision GT Concept, incorporating a stunning Alubeam painted exterior that includes a custom matte black hull and accents. The Cigarette Racing 50' Vision GT Concept has twin 1,650 hp Mercury Racing engines, which roar at 300 hp per engine higher than the standard engines used in the 50' Cigarette Marauder. Lightweight construction has allowed for approximately 1,000 lbs to be removed from the standard spec weight, thereby allowing the boat to have an estimated top speed of more than 140 mph at a length of 50' and a width of 8'. No detail was left untouched when designing the interior of the Cigarette Racing 50' Vision GT Concept. The crafted interior is black with black Alcantara accents, and uses carbon fibre dash panels inside the boat with silver face gauges. User interface technology is also maximised with Bluetooth, computerised controls, four high-definition displays, and the next generation integration of Garmin and Cigarette navigation and audio. The price of this one-of-a-kind boat from Cigarette Racing Team is US$ 1.5-million. The Miami International Boat Show is open to the public from February 13-17, 2014.